Like so many Japanese camera companies, Orion Seiki was formed in the immediate aftermath of WW2, concentrating initially with optics. Their first SLR was launched in 1955 (some carrying the ‘Orion’ name). 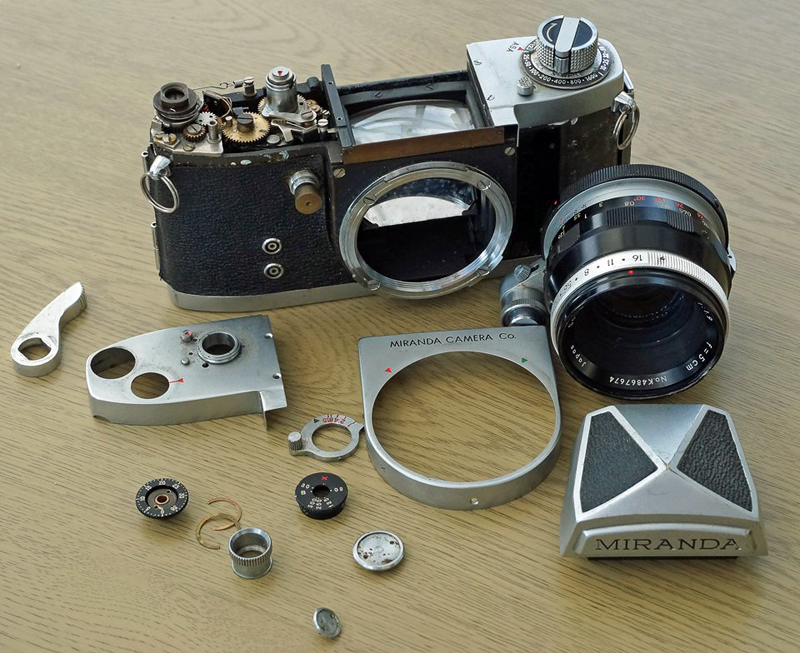 Development of the company’s SLRs continued steadily until the company went bust in in 1978, so vintage Miranda cameras are ones made before this date. 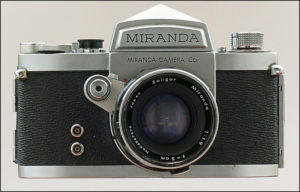 In addition to SLRs, the company also made one non-SLR camera, the Miranda Sensoret rangefinder. 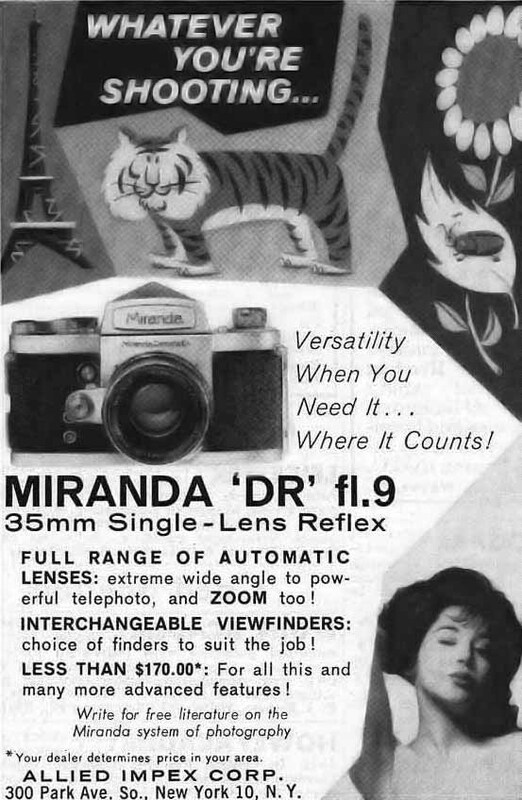 If you are collecting Miranda cameras, be aware that the Miranda name was later bought by the Dixon’s chain, who put it on a series of cheap and nasty budget SLRs, plastic point-and-shoots, binoculars, and no end of other tat. A sad end to a great name. Miranda were among the very first SLR manufacturers, although they went bust in 1978 following the unreliable DX-3. The unusual shutter position (on the front of the camera) gave rise to an unusual series of lenses where there was an extension of the shutter release on the lens itself, which closed the lens down just before tripping the shutter. These lenses are often referred to as ‘Pressure Activated Diaphragm’, or PAD lenses, although the contemporary literature calls them simply ‘fully automatic’. 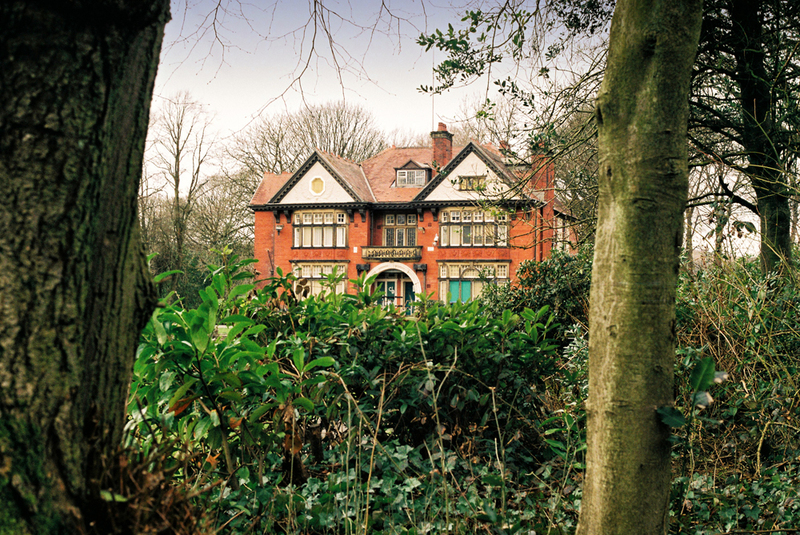 My example of such a lens is the 50mm F/1.9 – the other PAD lenses available were 28mm f/2.8, 35mm f2.8, 135mm f/2.8 and 35mm f/3.5. 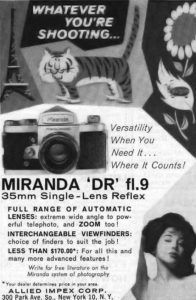 The difference between the Miranda DR and the DR2 (which may be an unofficial name) seems to be mainly that the DR is labelled ‘Miranda Camera Co.’, and the DR2 says ‘MIRANDA CAMERA Co.’ – that’s about all there is to it. This camera unfortunately came with a jammed shutter and a sticky lens aperture, so it will be some time before I can get a sample picture from it.